This question seems similar to these three below, but they relate to the bahaviours when logged-in versus logged-out. My question is applies when logged-in. Searching on Stackoverflow for [c#] [regex] should find items having both of these tags but it appears to be doing an or and finding items with either tag. 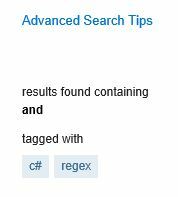 Comparing the top few results from the two searches [c#] [regex] and [c#] or [regex] gives the same results, very few of the found items contain both tags. The search box in the top line of the result page has reordered the tags so it shows these values: -[jmeter] [performance] -[yandex] and -[jmeter] [load-testing] -[yandex] and -[jmeter] [performance-testing] -[yandex]. Browse other questions tagged bug search . Is multi tag search broken? What are the critera that exclude those question from search?